Many Conservatives including Roger Scruton and Charles Moore have lamented the widespread disappearance of the traditional telephone box. Scruton once suggested protecting them by giving the status of losted buildings. Should Councils seek to safeguard thos that survive as an important part of the feel of our streets and villages? 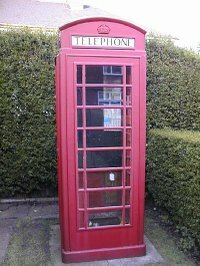 Local councils need to act immediately to save the celebrated, iconic K6 red telephone kiosks within their boundaries. Designed by Sir Giles Gilbert Scott to mark George V's silver jubilee, the red telephone kiosk first appeared in 1936. Within a few years some 70,000 graced urban and rural landscapes throughout the UK. With privatisation and the establishment of BT in 1984, successive culls have reduced the total to 12,747, and 4,619 of those are currently under threat. At a meeting hosted by English Heritage earlier this month, I and others made a strong plea to BT to extend their deadline of 1 October by which local councils must respond to BT's latest initiative on K6s. BT have responded positively and extended their cut-off date to 1 November. And fortunately, the new initiative enables councils to either adopt or sponsor K6s within their area – even those they may have previously agreed to be removed. Both options are succinctly and simply explained, along with a specimen legal agreement and application form, at: www.payphones.btcom/adopt_a_kiosk. Remember, if your council has already conceded removal, this new initiative means a potential reprieve: you can change your mind and adopt. Let's all make sure we do not lose any more of the beautifully designed red K6s.